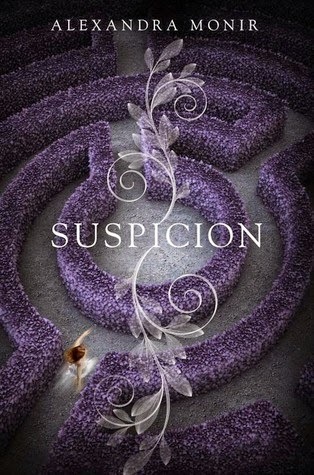 I love Alexandra Monir's writing (read my reviews of Timeless here and Timekeeper here) and I was so happy to receive a review copy of her latest novel, Suspicion. I loved the Timeless series for Monir's sweet love story and intense, fast-paced plot. I'm happy to say that I loved Suspicion for the same reasons. Suspicion is a stand-alone novel, something that was a huge positive for me. I love reading stand-alones because they provide so much closure. I love series as well, but really only when I can read all of the books in a series close together. There's nothing worse than having to wait years for a series to finish! Monir writes with such beautiful imagery. I felt like I was really there with Imogen, especially once she arrived at Rockford Manor. There was definitely an eerie feel to this book: it wasn't scary in a horror-type of way, just high on the creepy ghost factor. I'm no fan of ghost stories, and Suspicion definitely wasn't a ghost story, but it took me a little while to figure that out. Before I discovered the source of the malice in Suspicion, I was definitely spooked. Because I'm such a ninny about ghosts, I didn't read this book at night (pathetic, I know!). I was surprised by the ending, and loved the conflict resolution. There was a magical realism element to Suspicion and it was unique and very well-done. I was surprised by the depth in this story. My only complaint is that Suspicion was slow to start. Once the story took off, though, it was a great read. Suspicion was an easy, fast read. It is definitely YA, and may even be appropriate for an older MG audience. If you're new to Alexandra Monir, I highly recommend her books! I haven't ever read anything by Alexandra Monir, but this sounds really interesting! Thanks for sharing your review!